The rest of the wondrous story of 10-yr.-old Lucia and the Lady(s) of Fatima, told through a past-life regression with a woman named Anna. 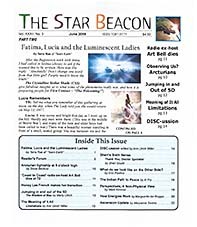 "Lights over the ocean," "Woman from Venus," "Human holograms" and "Visions of Mary." It apperars just after 8:00 pm in the western sky and tweaks out or slips behind the horizon around 10 pm. It is Arcturian! Art's obituary ... in DISC-ussion. Introducing his newly released book, COSMIC PARADIGM, "DISCOVERING TRUTH." "The Wisdom on Mau" discusses his personal adventures between dimensions. To understand how our "advanced civilization" got so far away from the natural order of nature, let's start by looking at our own Indian tribes. Are you personally experiencing the collapse of the old timelines? You're not alone!. The June 2018 issue also contains classified ads and other intriguing tidbits of information you won't want to miss.